A couple of years ago, before I learned how to knit, I found a book that changed my crocheting. It's called Modular Crochet by Judith Copeland and was published in the late '70's or early '80's. She created a way of crocheting sweaters out of various rectangles based on gauge and body size. It blew me away. I've made four sweaters so far and have plans for a lot more - in fact, my favorite sweater is a modular one and I'd wear it every day if I could. I almost want to crochet nothing but the great sweaters in this book - big heavy ones for winter, lighter short-sleeved ones for summer, sleeveless for layering, etc. It's a great book. No, I don't own it - it costs a fortune to buy. I copied almost all of the pages and have them in a binder. The selling price right now is in the hundreds of dollars - a sign of a desired book. The other day I got a new book that has also changed how I look at sweaters - Inspired Cabled Knits by Fiona Ellis. The projects in this book are amazing. Lately I've had a craving for cabled hoodies and one in my ravelry faves is from this book - I finally broke down and ordered it because it's so gorgeous. I can't even put it in words. She doesn't use the familiar cable patterns. She has created her own based on inspirations such as sand and lightning. My cabling experience is small. I've only done a couple of wristers and a headband so far. I'm going to practice some more, make some of the projects in Cables Untangled by Melissa Leapman (also a really great book with gorgeous sweaters and a couple of afghans that are so snuggly), and then begin the hoodie that started it: the Celtic Icon Hooded Zippered Cardigan. I'm almost done with the few Christmas projects I have. Now I have to wait and see if they like them. I have another scarf to show you. It's another lacy sock yarn one that was super easy and fast. Maybe you recognize the yarn - it's the first skein that I ever dyed with acid dyes, shown right here about a year ago. It knit up really pretty. The fiber is a wool-silk blend and is incredibly soft. 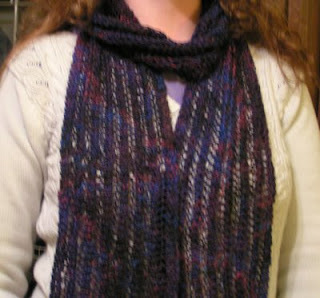 I'm not sure why I'm so attracted to long lacy scarves right now - I had never made a scarf before. I think that's all I wanted to tell you about. I blog alot in my head but when I sit down at the keyboard my mind kind of fizzles out. To the local people - be careful! We're supposed to get a big ie storm and I want everyone to be safe. Thant reminds me: Anna of Knitting up a Storm is having a rough time right now. Please remember her in your prayers and good thoughts. Thanks!